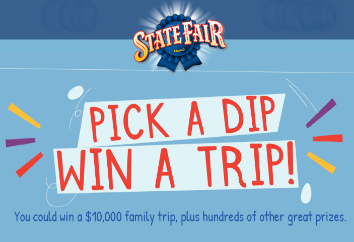 State Fair® Corn Dog Dip-Off Sweepstakes – Win $10,000! Win $10,000 for a family vacation! ENTER SWEEPSTAKES HERE – State Fair Brand Sweepstakes page. ENTRY LIMIT – Limit 1 entry per person per day. Entrants are not required to vote in each Entry Period in order to be eligible for any prize. ELIGIBILITY – The State Fair® Corn Dog Dip-Off Sweepstakes is open to legal U.S. residents residing in the fifty (50) contiguous United States and Washington D.C. who are at least the age of majority in their state of primary residence at the time of entry. SWEEPSTAKES ENTRY PERIOD – The Sweepstakes begins on March 17, 2018 at 12:00 AM ET and ends on April 29, 2018 at 11:59 PM ET. The Sweepstakes Period consists of four (4) entry periods (each, an “Entry Period”) wherein one (1) “Grand Prize” (as described below) will be available from among all eligible entries received in accordance with the entry deadlines stated below. In the first, second, and third Entry Periods, there are scheduled drawings for additional prizes as listed below. Non-winning entries in the first, second, and third entry periods will NOT roll over into subsequent round drawings, but WILL roll over for the “Grand Prize” drawing. Each Entrant may only win one prize per period. At the conclusion of the Sweepstakes Period, the fourth Entry Period drawing for a “Grand Prize” will award one (1) Grand Prize in a random drawing conducted from among all eligible entries received throughout the Sweepstakes Period. One hundred (100) round one prizes consist of a water bottle. The approximate retail value (ARV) of the round one prize is $24.69. The total ARV of the round one prizes is $2,469.00. Twenty (20) round two prizes consist of a skateboard and helmet. The ARV of the round two prize is $197.91. The total ARV of the round two prizes is $3,958.20. Five (5) round three prizes consist of a bean bag toss. The ARV of the round three prize is $299.00. The total ARV of the round three prizes is $1,495.00. One (1) grand prize consisting of a $10,000.00 check for a family vacation.